I’ve been playing a lot of Dead Island recently and there are a few bits in the game that really creeps me out which has made me think about various other creepy moments in games, now although my gaming history is fairly limited I had a few ideas on my mind. 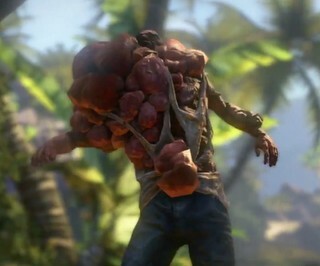 Dead Island is a zombie survival game so it is jumpy in areas and there is a selection of different types of zombies to kill. The one that always sends a shiver down my spine is the Suiciders. The Suicider is the only zombie in the game that talks, the others will scream and groan but this one will walk towards you fairly slowly saying ‘Help me!’ which is what gives me the creeps. At first glance I thought that they would be hard to kill but they are filled with gas which gives them big blisters all over the top half of their body which explodes with a hit, shot or if you get too close they tend to explode by themselves so you have to attack from a distance as the explosion will do a lot of damage or even kill your character. I feel strange saying the next one as they game itself is quite bright and light-hearted but the next creepy in game moment is in Fable 2. Now in Fable 2 you have demon doors scattered around Albion and to get through you have to solve little riddles to get through. The one in Wraithmarsh leads you to Cotter Cottage which inside has a diary written by Terry Cotter which tells you about his relationship with his mother and how she had passed away. He writes about reading a book on his Mothers shelf called The Knights Abberant which is about an army made out of clay. You then walk around a bit more and come across this whole army and seeing them all standing there is the freakiest thing. I was expecting them to come alive and start attacking me but no, they just stand there. I hacked them all up which was quite satisfying but then you come across a bed with Terry Cotter’s corpse on and his final diary which basically he tells about how the army would watch him and it seems to of driven him mad. Which I can see why, they are freaky as hell. The next one is a game that I played a very long time ago on my Grandad’s PC and it used to make me so nervous when playing it but it was a brilliant game. It’s called Maniac Mansion and it was realised in 1987, it was a simple point and click game about a character called Dave Miller who goes looking for his girlfriend in a mansion after she is kidnapped by a mad scientist. The game has so many B horror movie clichés and it’s such a laugh to play although fairly difficult as you have to move around trying not to get caught by these weird alien creatures, if you get caught it’s game over. This entry was posted on Tuesday, January 29th, 2013 at 6:50 PM	and tagged with Creepy, Dead Island, Fable, Fable 2, Game, Hibiscus, Maniac Mansion, Zombie and posted in Games (Traditional, RPG, etc). You can follow any responses to this entry through the RSS 2.0 feed.